Honey is one of the most common home remedies for asthma. It is said that if a jug of honey is held under the nose of ail asthma patient and he inhales the air that comes into contact with it, he starts breathing easier and deeper. The effect lasts for an hour or so. One to two teaspoon fills of honey provide relief. Honey can also be taken in a cup of milk or water. Honey thins out accumulated mucus and helps its elimination from the respiratory passages. It also tones up the pulmonary lining and thereby prevents the production of mucus in future Some authorities recommend one-year old honey for asthma and respiratory diseases. Turmeric is also regarded as an effective remedy for bronchial asthma. 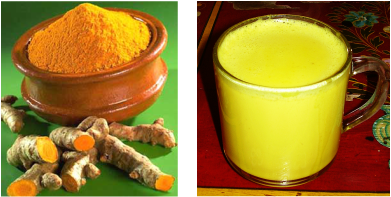 The patient should be given a teaspoon of turmeric powder with a glass of milk two or three times daily. It acts best when taken on an empty stomach. Garlic is another effective home remedy for asthma. Ten garlic cloves, boiled in 30 ml of milk, make an excellent medicine for the early stages of asthma. This mixture should be taken once daily by the patient. Steaming ginger tea with two minced garlic cloves in it, can also help to keep the problem under control, and should be taken in the morning and evening. One of the preventive measures to stop attacks of asthma is to drink water which has been kept overnight in a copper vessel. This water, with traces of copper in it, is believed to change one's constitutional tendency to get respiratory problems. Make fresh daily. Cut an onion into very thin slices and place in a bowl. Cover the onion slices with honey and let sit overnight. The next day; scrape the honey from the onion slices and take 1 teaspoon 3-4 times daily.